This is a big dog with a big personality. He's an energetic, intelligent companion who makes life interesting with his independent thinking and playfulness, but dominant personality and bold approach to life. In short, he's a handful, even for experienced dog owners. Still, in the right home he's a loyal and courageous companion. 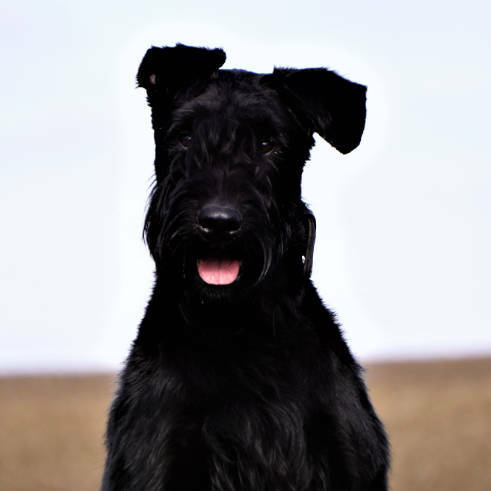 There is no limit to the capabilities of a well-trained Giant Schnauzer. Obedience, agility, tracking, carting, and herding are among the dog sports in which you can find him competing. Originally used to drive cattle to market, he excels as a police and guard dog and more recently has branched out to drug detection and search and rescue. He has a gentle and loving side as well, making him an admirable therapy dog. But the Giant Schnauzer's favorite activity is being with the people he loves.